WHEN: Fridays: September 15, 29 at 8:00pm; Saturdays: September 16, 23, 30, at 8:00pm; Sunday: September 23, October 1 at 3:00pm. A talkback will be held following the Sunday, September 23 performance. Audiences are invited to join in a special wine and cheese reception in the theater lobby following the opening night performance. TICKETS: $18 for adults and $17 for students and seniors. For reservations, call (732) 968-7555, or buy tickets online at www.circleplayers.com. A new, modern interpretation of Shakespeare’s classic history about the heroic and ruthless king, Henry V of England, determined to lay claim to the kingdom of France. 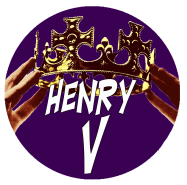 Despite the self-doubt and diminished morale of his own army, Henry’s sheer determination and impassioned speeches ready his men for the bloodiest of battles—Agincourt.